It is Freedom Day, and freedom is the most beautiful word which has a place in all aspects of life, and it is the most innocent term, yet it can be the most far fetched to attain. The history of humanity has demonstrated a negative record with regards to freedom. In other words, not only does it have an oppressive and dark record with regards to the prevention of freedom, but also with regards to exercising and applying freedom; because in the name of freedom, and while pretending to exercise freedom, they would limit freedom to their own taste and liking, their own ideologies and thoughts, and their own religion. They would say freedom is what we are saying - this is freedom! For example, hundreds of years ago whey wanted to impose their viewpoints with regards to the discovery of Hijab (head covering), they would force women to remove their chadors and would say that this is called freedom, and women should be free! After a hundred years, with regards to the definition of women's freedom, they are still restricting women by saying that women's freedom is secured in this or that manner! Also, in Western countries, the word freedom does not exist in its real sense because if a person tries to defend the interests of his people in a country, they will prevent him from doing so, as this has been the case for many of my closest people, and I have also been told the same. A few years ago, they said that "a certain European country is willing to accept him, provided that he will not be active" - well, this is called suppression of freedom. Humans deserve freedom of thought, yet often, in many religions the freedom of thought is suppressed and they call this the red line which cannot be crossed - it is the forbidden area. The fact that those in charge are free to suppress the "breath" of the people, actually means freedom for the oppressor, while it means suffocation for the innocent, and in fact the definition is reversed here! They say that we wish to exercise freedom - the freedom which is defined through the framework of despotism. In all religions, the religious teachings often deprive people from freedom and the believers of different religions have always been tormented and have suffered. That is why it has become common to abandon ancestral religions and at times this phenomenon can be on the rise. Freedom for choosing a profession, freedom for choosing a religion, freedom for voting - for example when a thousand candidates turn up for elections, they eliminate most of them and leave only about ten at the end; they say that you are free to vote for these ten people, well how is this possible? This freedom is just like what was described in Rumi's Mathnavi selections about the "lion without a head and tail or stomach." Now, at times some countries present someone and say you have to vote for him, or when they want to change a regime, they do not offer more than two choices - this one or that one? Yes, or no? In other words, they do not allow for ten options to be on the table and for people to choose from! Freedom has constantly been attacked throughout the entire history of humanity. A human being needs freedom, even breathing the air which has now become contaminated and does not have oxygen anymore, has deprived the citizens from freedom for taking their desired breaths, meaning having energy for survival; or the water which is contaminated or is in existent - the distribution of water is unfair, or the underground resources, natural mines and national wealth, have all been concentrated at one place and are being used according to the desire of one person -meaning concentrated through a particular school of thought with a certain vision and viewpoint; in other words the wealth of the nation is exploited by a small group and the rest of the people are not free to use their own wealth - they are not allowed to have a comfortable life! Deprivation of freedom means deprivation of oxygen. 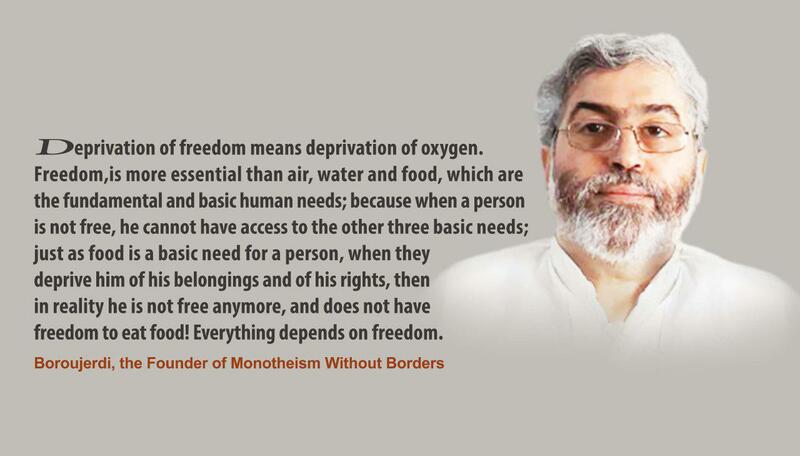 Freedom, is more essential than air, water and food, which are the fundamental and basic human needs; because when a person is not free, he cannot have access to the other three basic needs; just as food is a basic need for a person, when they deprive him of his belongings and of his rights, then in reality he is not free anymore, and does not have freedom to eat food! Everything depends on freedom. I am hoping to see the day that God willing, freedom will be widespread, global and free of aggression by oppressors and the violent forces.